The best way to design an Hawaiian Nursery Theme will be to blend a classic mix of surfboards and tropical prints. It's possible to take your tropical Hawaiian decor in a feminine, masculine or in a colorful gender neutral direction, so decide which style of nursery theme you need early in the project. 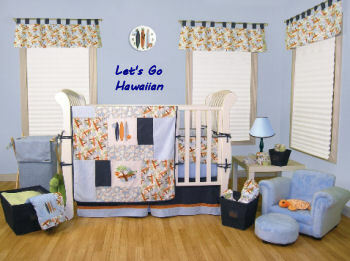 Hawaiian print baby bedding for your baby's crib and a few baby safe luau beach party props will bring a fun Hawaiian tropical surf or beach theme into your baby's bedroom. We have lots of Hawaiian theme ideas such as how use a thatch roofed tiki hut for window treatments in your tropical themed room and hula skirts for crib skirts. Get ready to create your very own island paradise to enjoy with your baby right in your own nursery until a beach vacation is possible. Do you have a great set of baby bedding or a picture of a nursery? Share it! Do you have a little surfer girl or a baby beach boy? Either one would love a tiki hut or beach shack in a cool Hawaiian themed nursery. Aim for decor that mimics the atmosphere of a beach on one of the Hawaiian islands complete with surfboards decorating the walls and marine life to complement your Hawaiian nursery theme! Think about using lots of palm tree stickers or wallies in a tree mural for the walls, bright primary color surfboards, multi-color tropical floral prints, beach sand and ocean blue paint colors. You can decorate cool Hawaiian Nursery Themes for your baby boy or baby girl really cheap! This is a versatile unisex nursery theme that's very easy to do yourself! If this is your first baby, a gender neutral background and nursery theme may be the best (and didn't I mention that this theme is cheap!) way for you to go! Start with a cool baby's bedding set, while there may not be much baby bedding available as Hawaiian baby bedding per se, suitable baby bedding is easy to find. 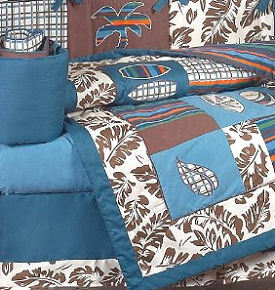 Baby bedding and accessories that focus on sand and sea will do for your Hawaiian Nursery Theme. Palm tree motif baby bedding can be used as well. You will make these rather generic items blend into your Hawaiian nursery theme by the other accessories you put with them. Do you have a crafty friend? Put a Hawaiian Baby Quilt on your baby shower wish list registry right away! A traditional Hawaiian Baby Quilt Pattern will add to any other bedding pattern that you may have chosen, as your Hawaiian Nursery Theme is a very eclectic colorful theme. Choose colors of a Hawaiian sunset, the blues of the ocean, deep greens with splashes of bright Hibiscus pink for a classic Hawaiian themed nursery layout. Paint a palm tree mural or use one of the mural stencils for a nursery focal point. Personalize baby's nursery furniture with some Peel & Stick Hibiscus flowers. Stencil some Hawaiian motifs on the baby bedroom walls. Use some of the free printable stencils online or make your own unique designs from a Hawaiian kid coloring book! If you're familiar with stenciling go for the realistic look of a layered stencil design. Make one wall your painted tropical theme focal point and paint the other walls in solid, complimentary colors. Punch up the neutral shades of beach sand and bamboo with the bright flowers of the tropics for a baby girl, and brightly colored surfboards for a baby boy. String party lights over the windows for a nighttime color display to highlight your chosen nursery painting technique for your Hawaiian Nursery Theme. Get a ceiling fan suitable for kids rooms with wooden blades carved to look like the leaves of a palm tree with a light kit. Grass Hula skirts can be used as toppers for your Hawaiian Nursery Theme window treatments and for a really hip Hawaiian dust ruffle on the baby's crib or even for the curtains all by themselves. Wooden roll-up blinds will serve as room darkening shades and look very natural in your baby's beach hut. Soften the effect with a light gauzy fabric drape that will blow softly in the breeze. A bamboo cane fishing pole will make a cute drapery rod. Use palm tree leaves, raffia and bamboo wherever possible. The natural fibers can be used to embellish accessories that you may already have on hand for your tropical Hawaiian Nursery Theme! For lighting place palm tree lamps on the top of baby's dresser, palm leaves on the blades of the ceiling fan and they can be used as cover ups for the nursery cornice board. Think of creative ways to meld Gilligan's Island beach decor with baby nursery chandeliers! Tropical birds will bring a lush tropical Hawaiian feel to the room. Life-size stickers of tropical parrots or any colorful birds among the palm tree branches of your nursery wall murals. Some stuffed parrots, chimpanzees, will be welcome playmates for baby later on. Hawaiian memorabilia has gotten rather pricey even on Ebay, but if you are fortunate enough to have a collection, some vintage hula girls can be placed on floating wall shelves. For the nursery wall decorations some tropical flower art prints would be cool for a baby girl's nursery and surfer, beach or ocean prints for a boy's Hawaiian themed room. Head out to the pawnshop and pick up an abandoned surfboard cheap and refinish it in an appealing nursery color scheme. Personalize your decorative items with baby's names! Get more than one and attach them to the nursery wall or even the ceiling! Do you have a woodworking husband? Have him make some surfboard shaped nursery furniture! Get some brand new antique looking Hawaiian Tiki Masks. You could probably pass off some African masks in a dark wood as Hawaiian. 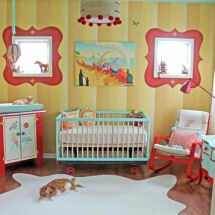 To find more Hawaiian theme nursery decorating ideas please visit our nursery picture gallery often!